Redwyn’s Dunes were named for a character in William J. Skora’s novel, “The Lost History of Redwyn.” Skora wrote the Arthurian-themed novel among the dunes after he was moved by their natural beauty. The sanctuary is located along the Keweenaw’s Great Sand Bay. Over the years, William and Debra Skora have made a series of property gifts to MNA. Part of the sanctuary is dedicated in memory of William Skora’s grandfather and great aunt, Bertrand B. Balkema and Mame Swykert, respectively. Balkema was Chief Engineer in the U.P. for the WPA during the Great Depression and fostered such projects as Keweenaw Mountain Drive. He appreciated the beauty of the U.P. and left his mark there in an unobtrusive way. Mame Swykert was a pioneering woman who built the first holiday cabins in Copper Harbor, organized construction of Our Lady of the Pines Church, taught school in Laurium and worked tirelessly to help alleviate the hardships that mine closures and the Depression brought to the Keweenaw. The 36.37 acre sanctuary is located on Keweenaw County’s Great Sand Bay. 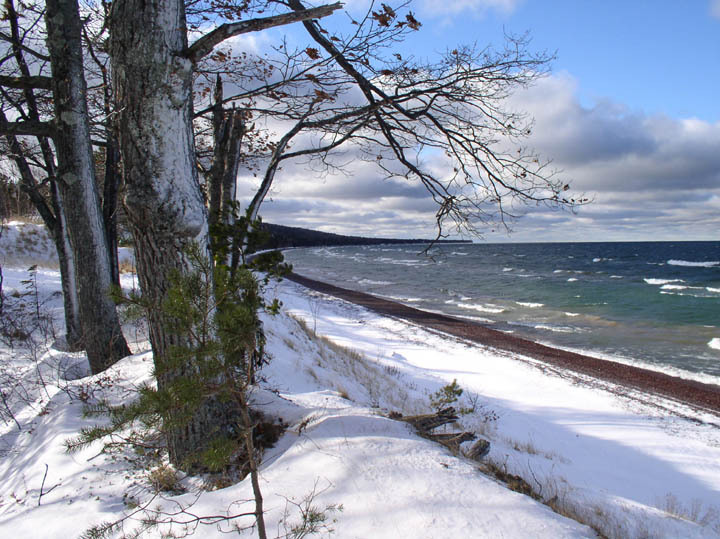 The shoreline of Great Sand Bay receives the full force of the strong prevailing westerly winds off Lake Superior and the shoreline has sand dunes up to 100 feet in height above the shoreline. The formation of these dunes is the result of large deposits of sand which were laid down by strng winds, currents and wave action of Lake Superior following the ice recession. The back inner dunes are vegetated by juniper clones as large as 15 square feet, and by wind-contorted red pines and aspen. Additional tree species include white pine, jack pine, red oak, red maple and white birch. The sanctuary is a favorite resting spot for the migrating waterfowl in the wetlands along the back dunes. Beavers, killdeer and song birds are also present among the varied plant life. Club mosses, holly and dwarf blueberry can be found at Redwyn’s Dunes. Follow M-26 about 3.5 miles north of Eagle River or 4.5 miles south of Eagle Harbor. Look for the MNA sign on the east side of M-26 along Great Sand Bay marking the trailhead.